How about this for a practical gift idea for her: Schick® Hydro Silk™ Holiday Pack. I say practical because it’s something that can actually be used and it’s an excellent quality and value. This is the type of gift that my mom would buy for my sisters and I. She’s always trying to think of things we need and she loves a good deal. This particular set is only $13.99 so it’s very affordable. 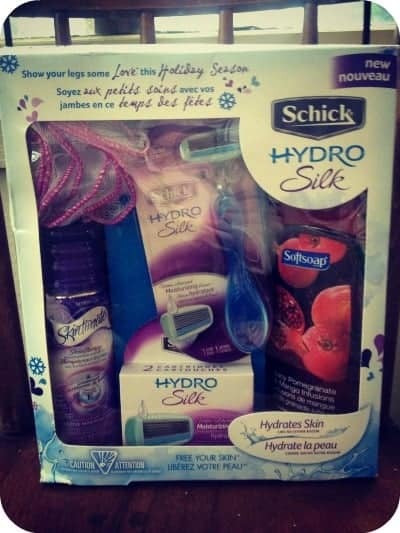 If you are buying for a Secret Santa Gift Exchange, the Schick® Hydro Silk™ Holiday Pack is a wonderful gift. It’s got everything you need to pamper yourself. Bath time is “me” time and it’s one thing I really look forward to. The Schick Hydro Silk Razor gets the job done without nicks! Besides getting a close shave, it also replenishes your skin’s natural moisture with its Water-Activated Moisturizing Serum for up to 2 hours after you shave. I usually cut myself with the cheap razors and end up with razor burn. I love how the Skintimate protects my sensitive skin and my legs come out of the bath soft and smooth. Keep Schick® Hydro Silk™ Holiday Pack in mind when you are out doing your holiday shopping for a special female on your list. This would be a great gift!!! Awesome gift, I would love to have this myself! this looks like a really nice gift for someone! thanks! It does look like a good deal- and you’re right, it’s a great idea for a secret santa gift. I actually bought one of these for a present today, makes a great gift. I use this product and its the best razor I’ve ever run across; definitely makes quick and efficient work and would make a great gift. Awesome gift! That’s a great price for such a set! I know someone that would have no problem using every item in this pack. Great gift idea! Thanks for sharing!! This would make a great gift for my sister in law.